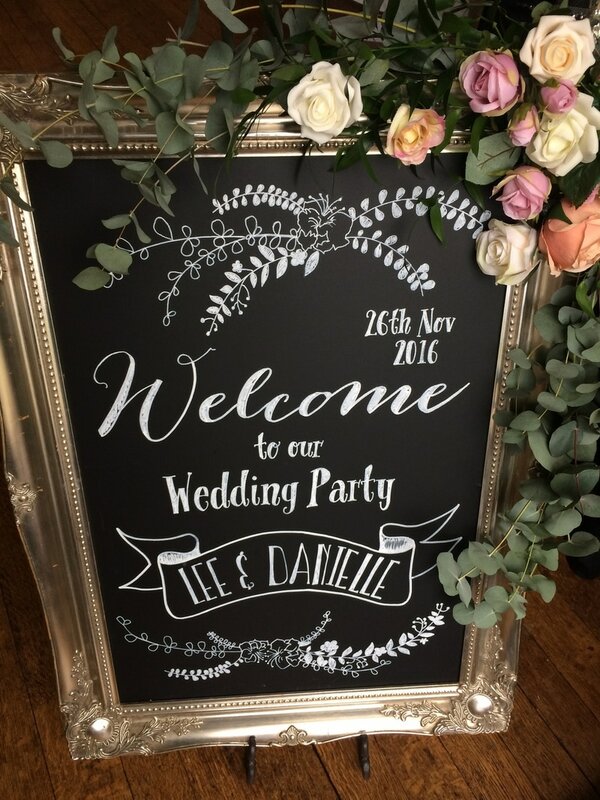 Our authentic chalk board artistry can transform any sized board. 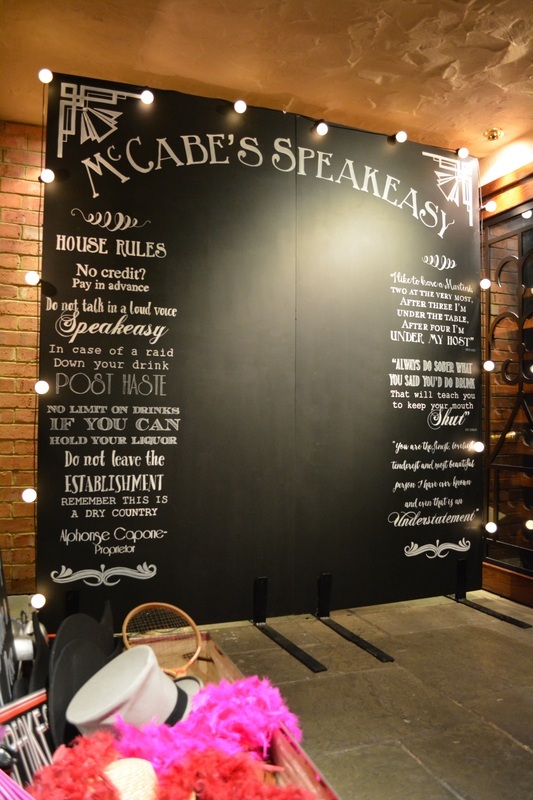 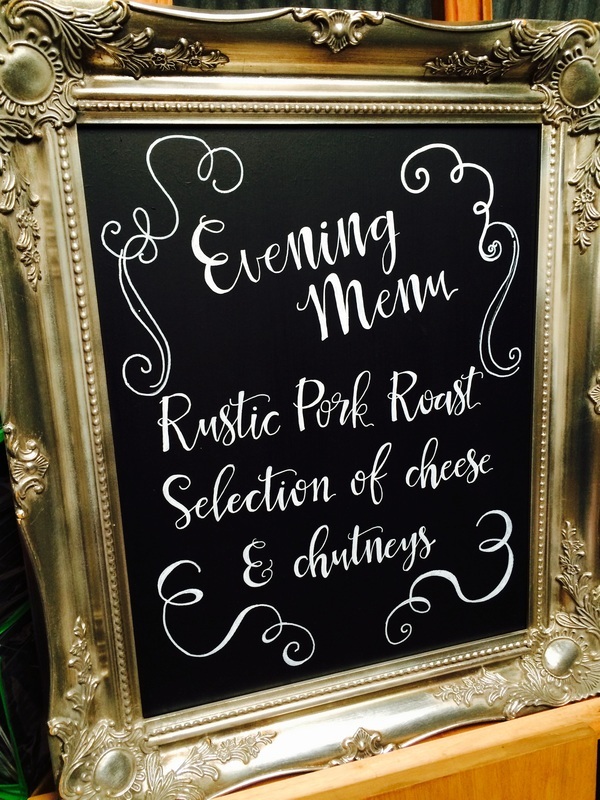 All boards are bespoke and hand painted, no printed posters, we like the feel of the good old black board! 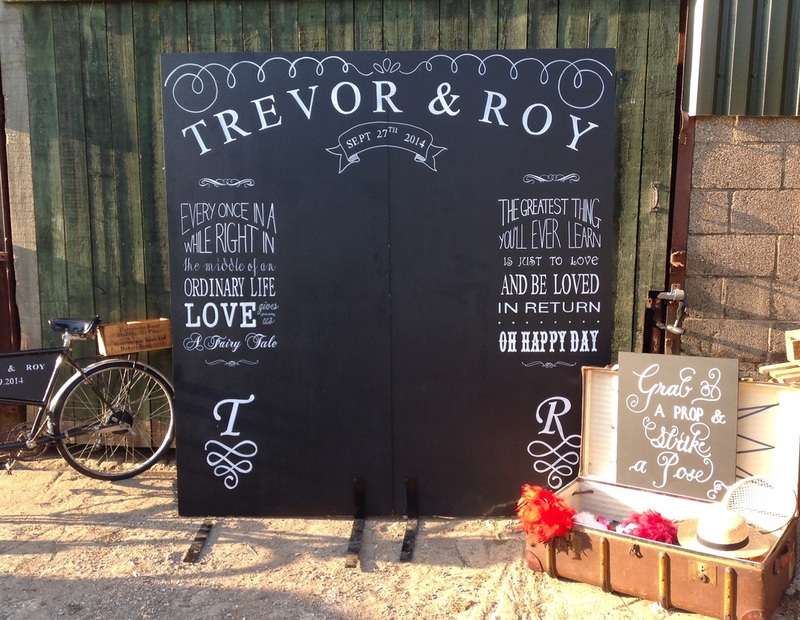 Giant backdrops perfect for DIY Photo booths, large table plans, welcome boards and signage. 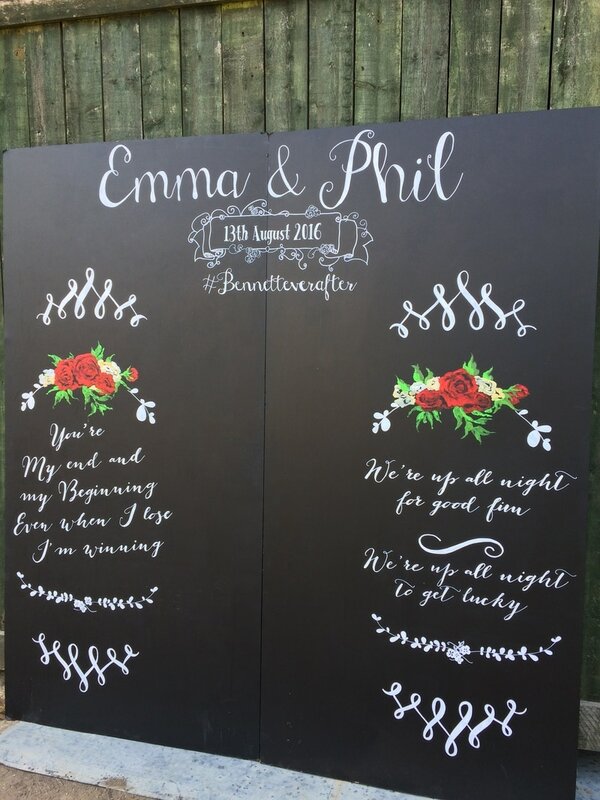 We have boards of all sizes Contact us with your requirements, also happy to customise a board for you if you have something different in mind..
​Fab addition this year, the large freestanding Polaroid board. 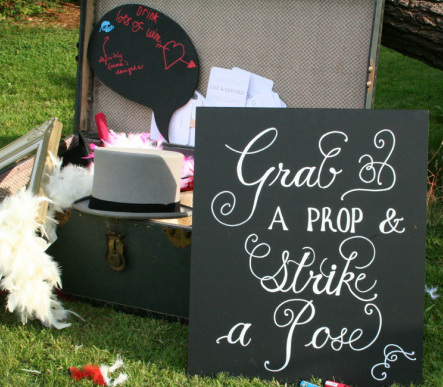 Snap it, Shake it, Sign it, Stick it. 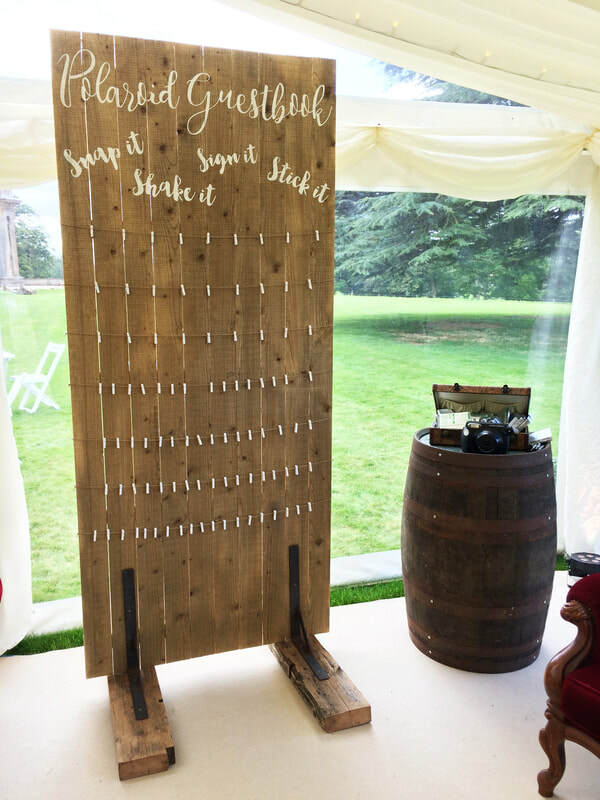 This went down really well at Turvey House earlier this year teamed with one of our whisky barrel tables with a vintage suitcase filled with polaroids and surrounded by our pretty vintage sofas. 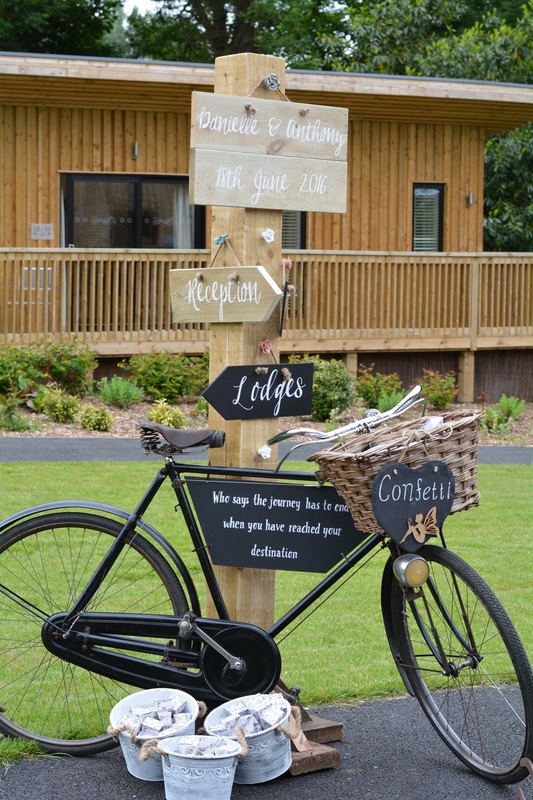 It worked really well as a chill out/photo sharing zone...reliably informed that a lot of fun was had by all! 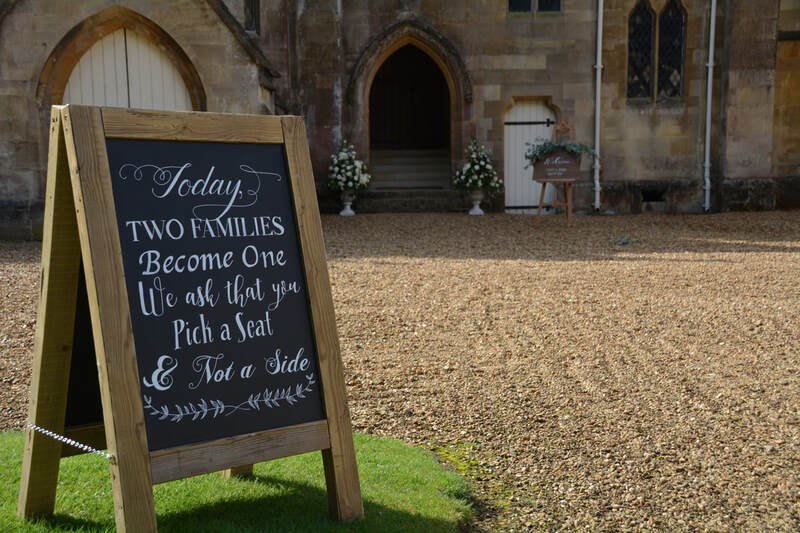 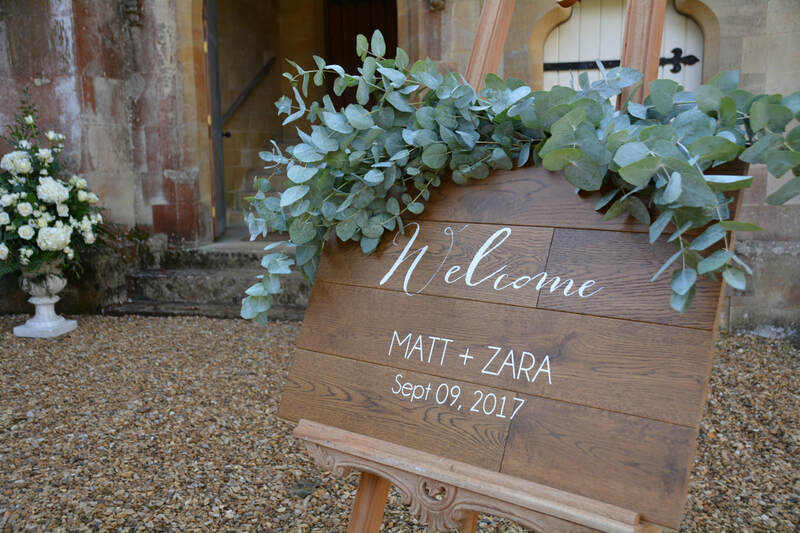 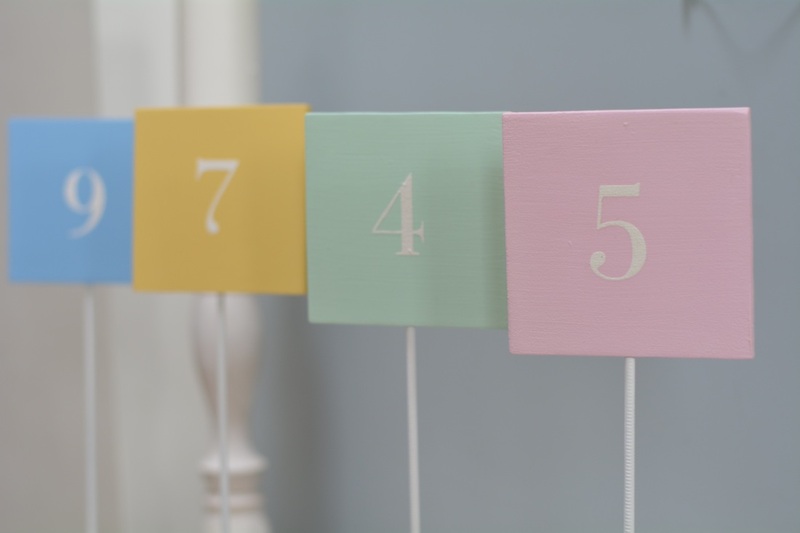 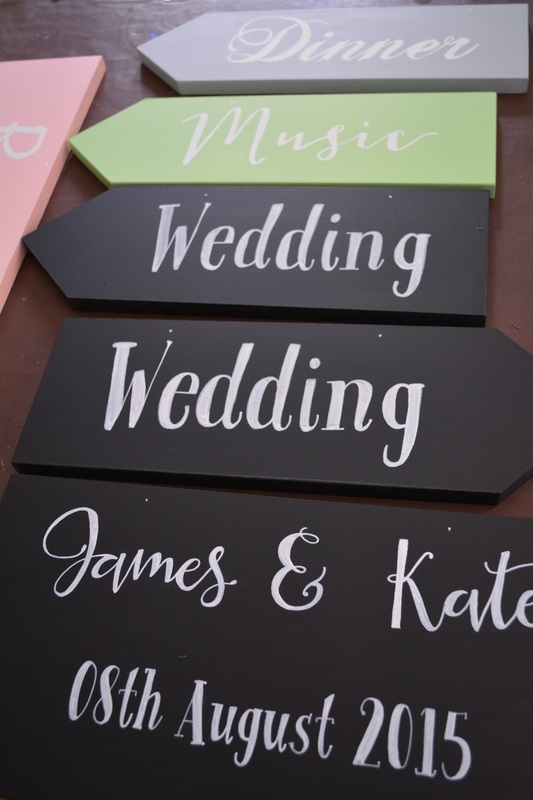 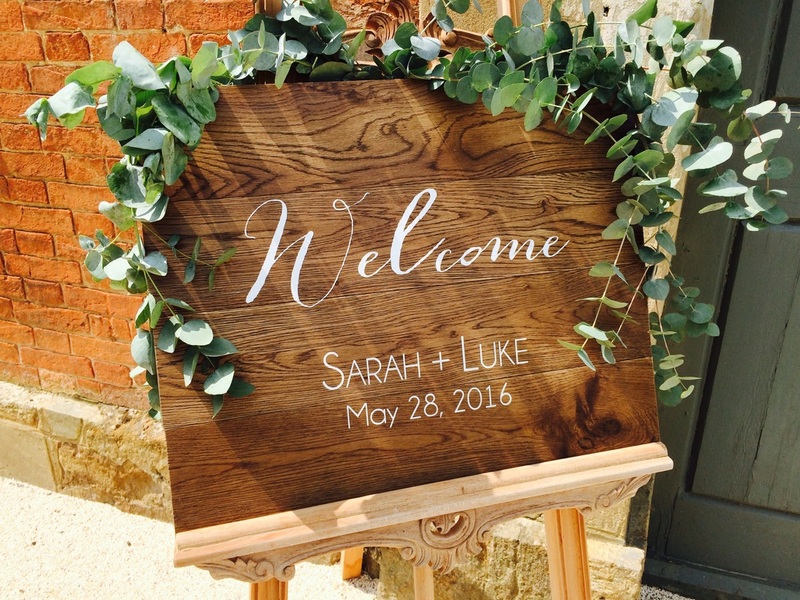 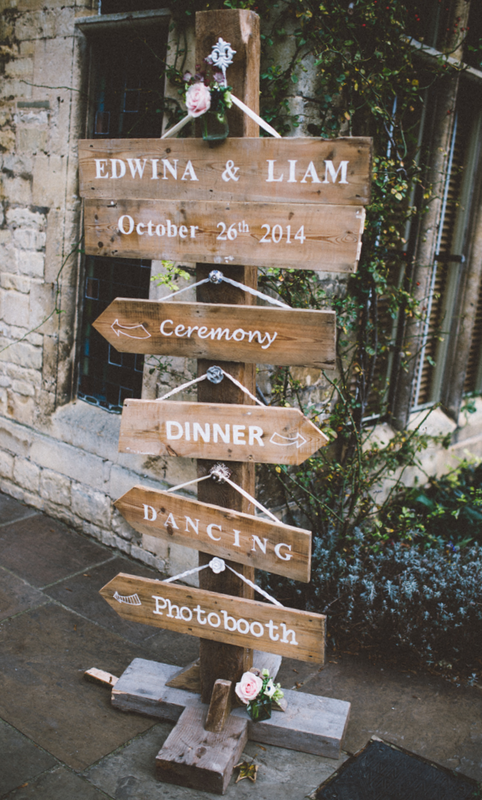 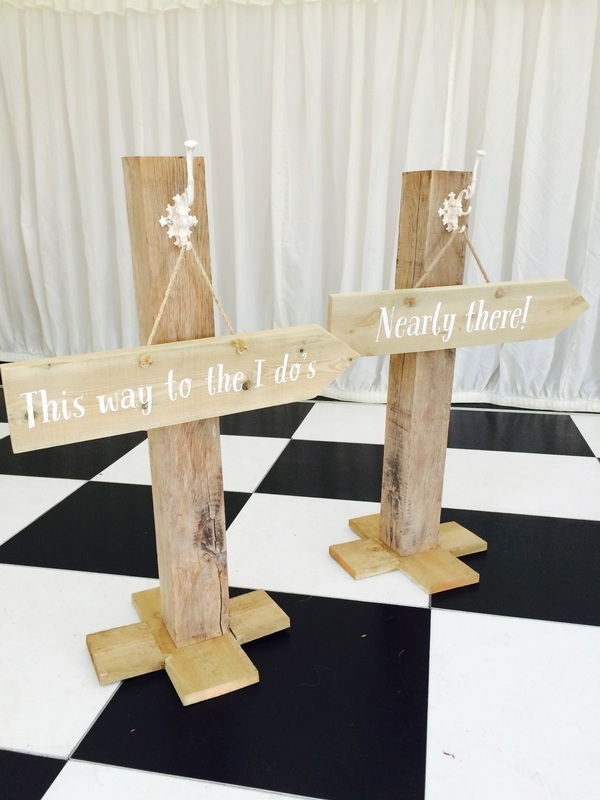 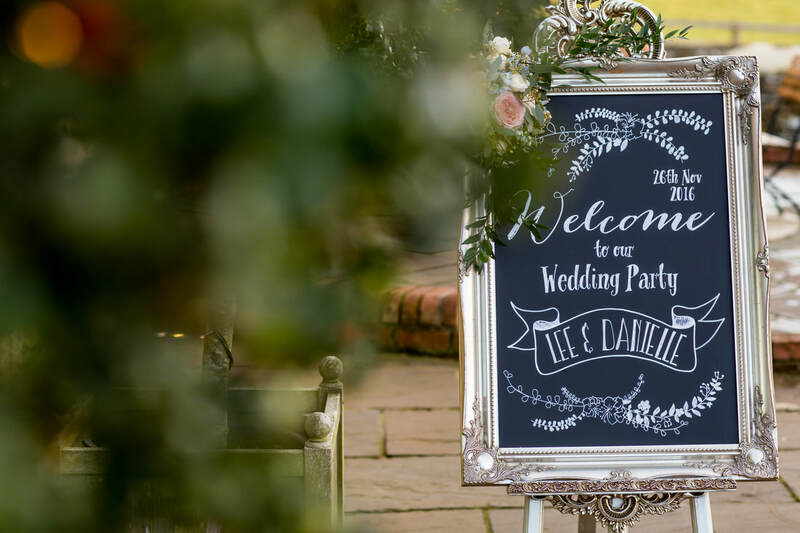 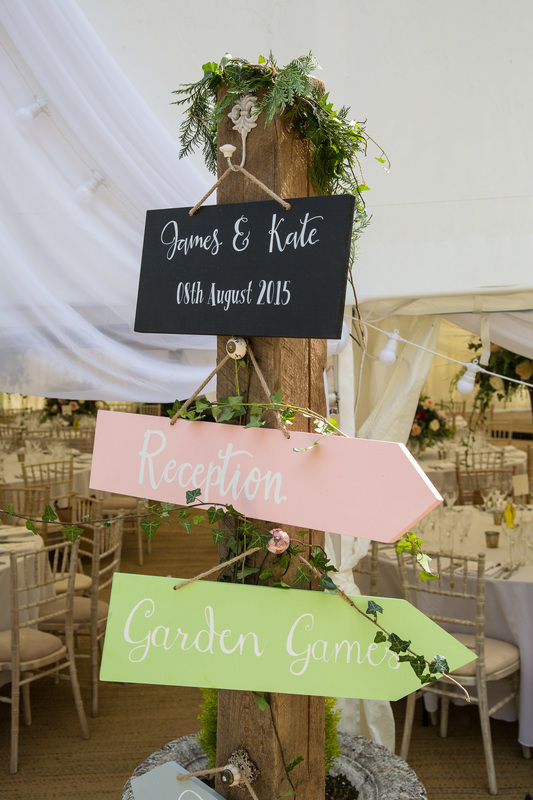 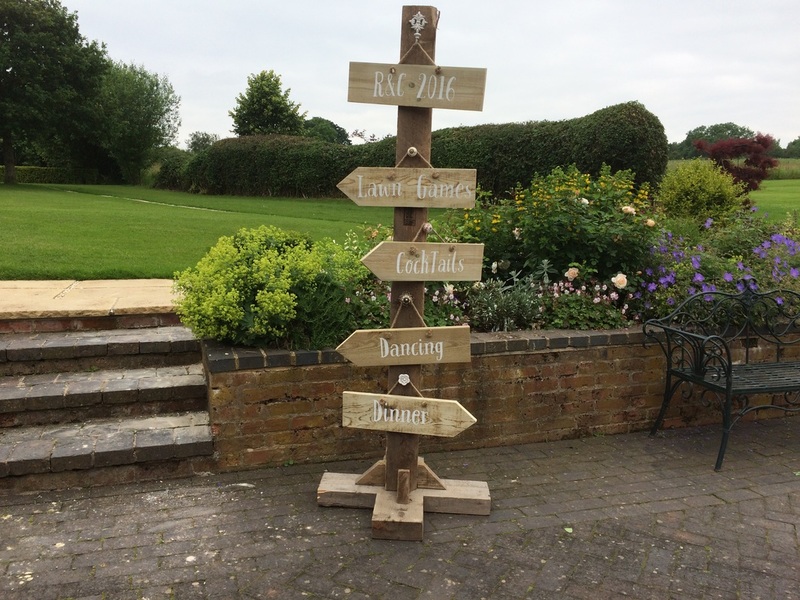 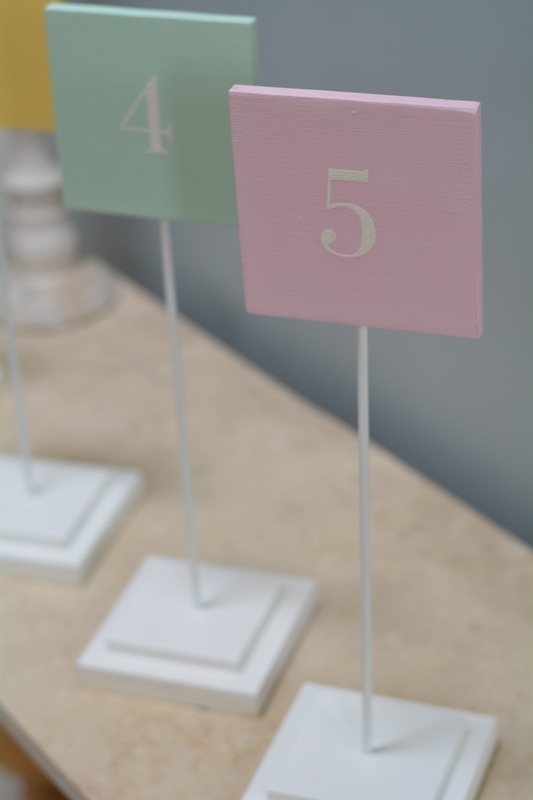 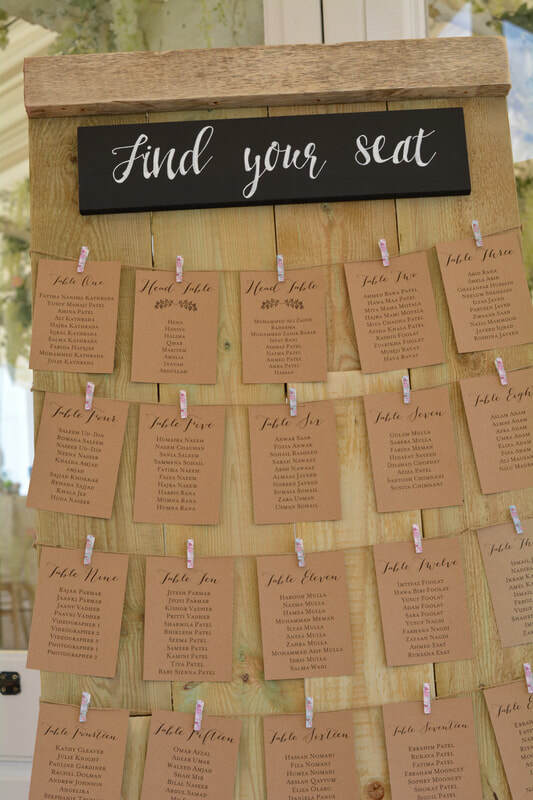 The sign post is a great feature to guide your guests around your wedding. 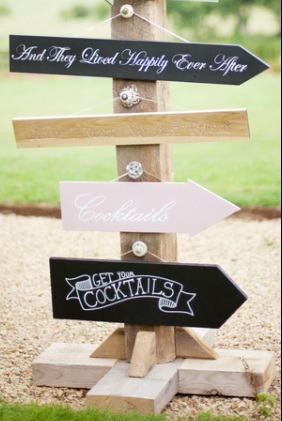 If its not actually necessary but you still want to have it, fill the sign post with quotes and anecdotes about how you met. 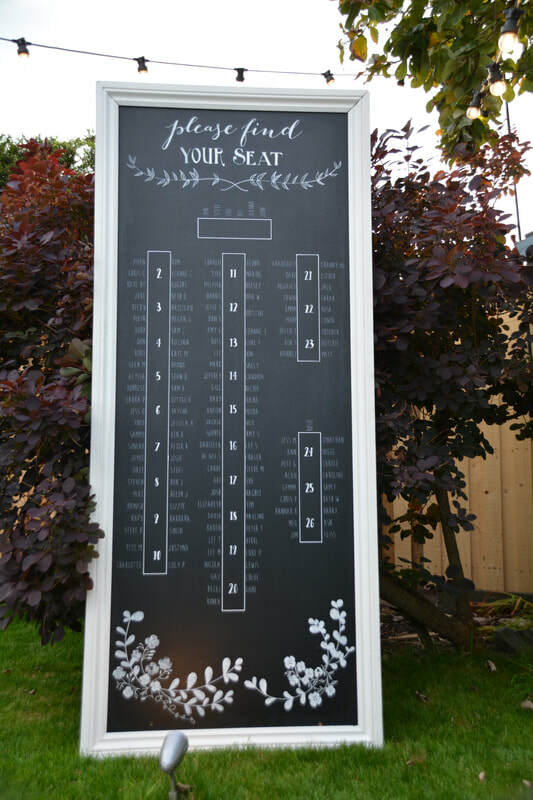 We have a variety of different sized table plans available. 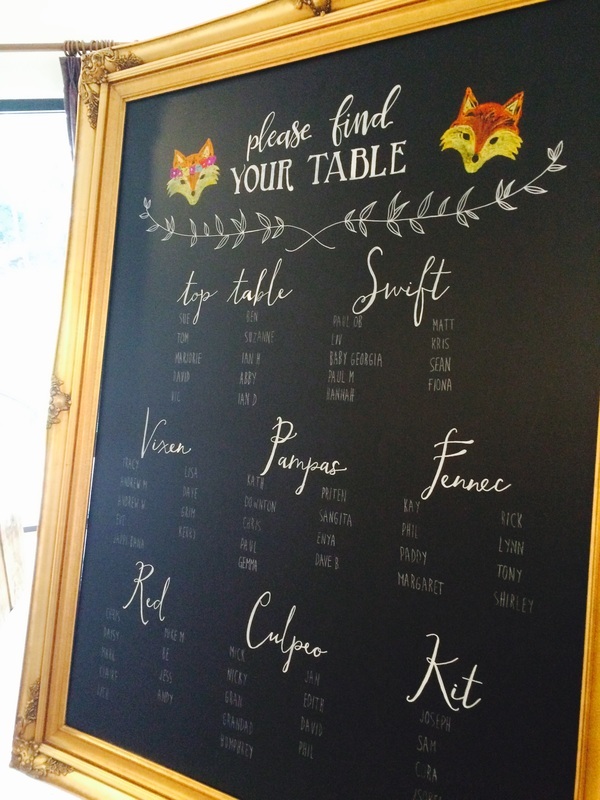 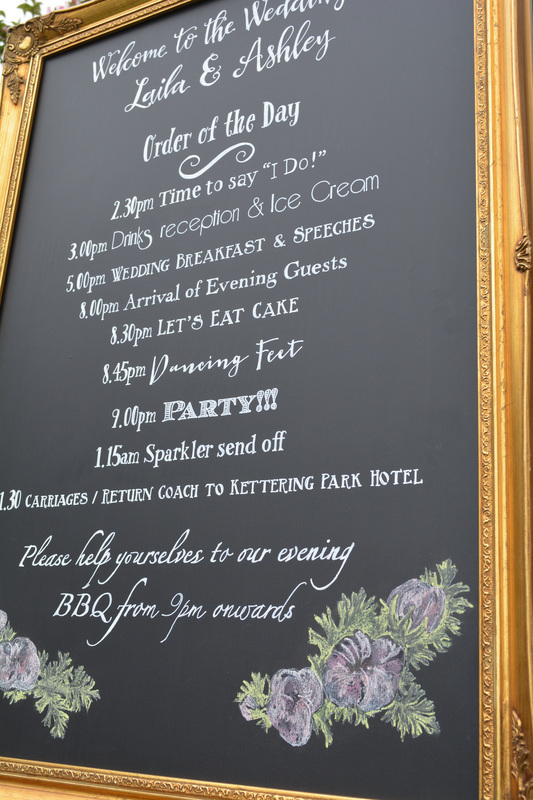 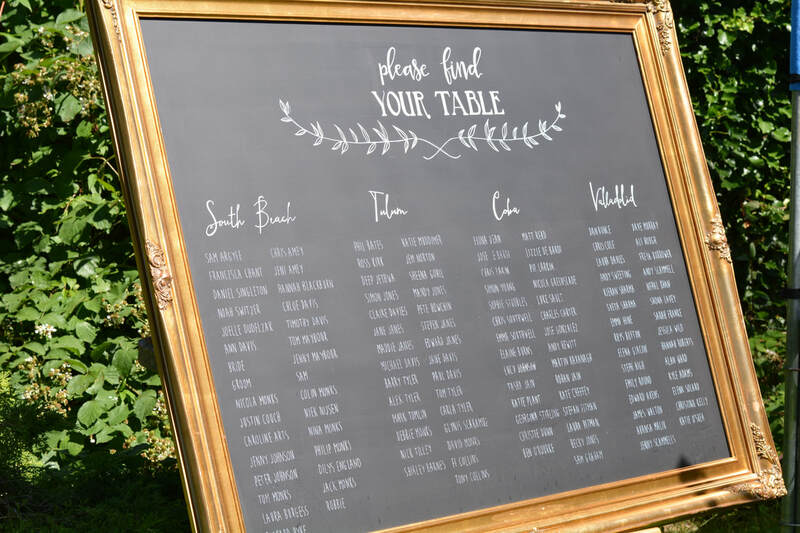 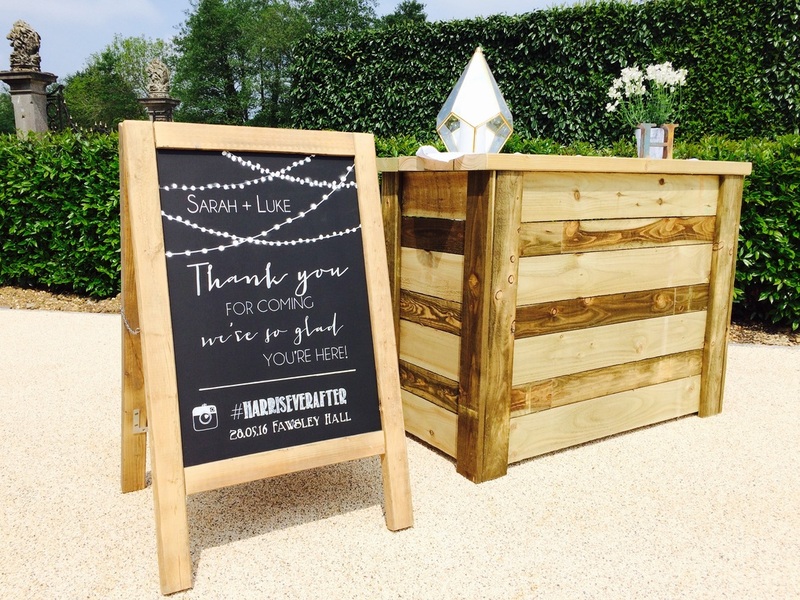 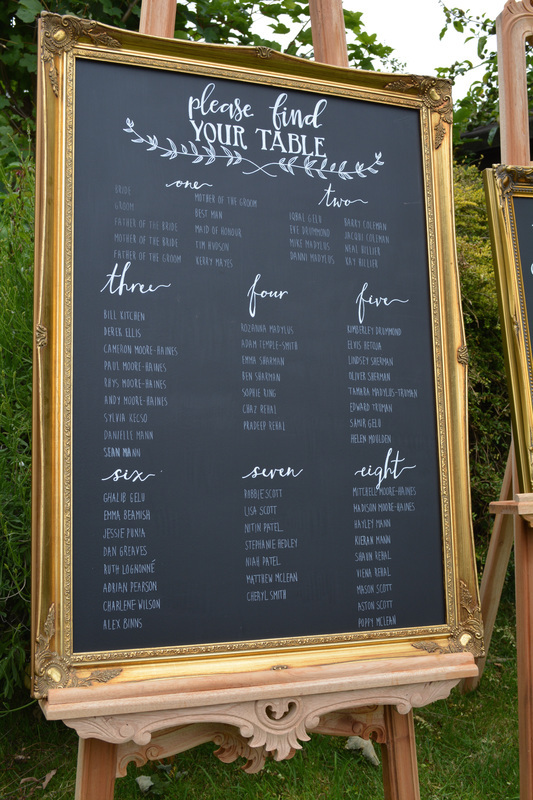 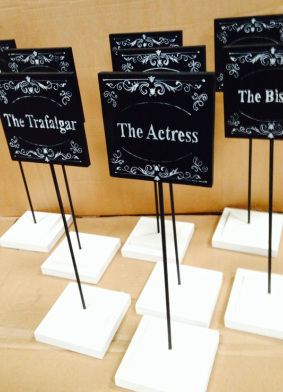 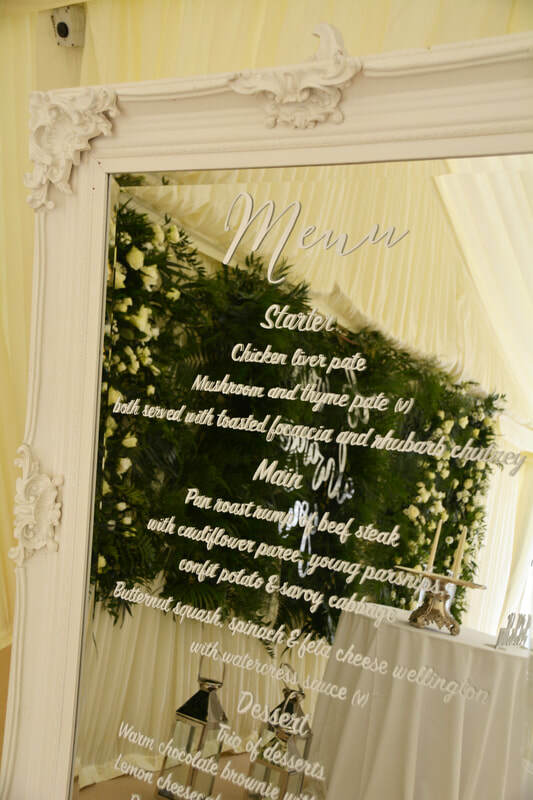 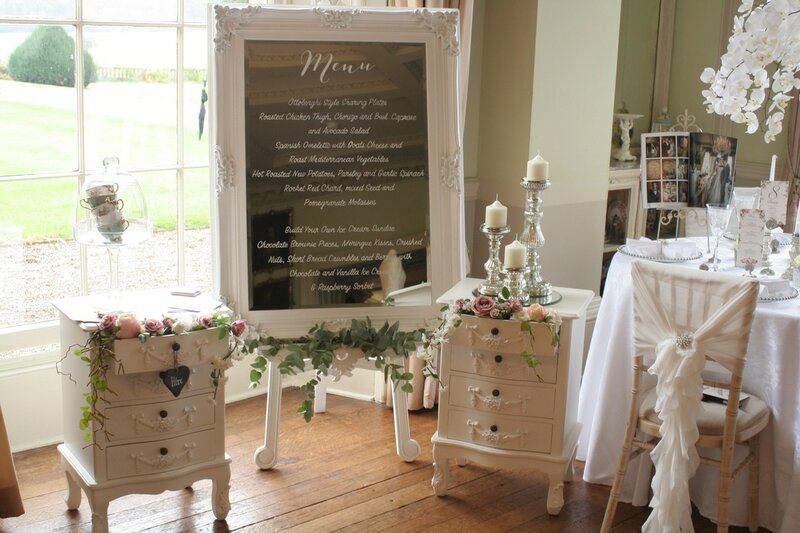 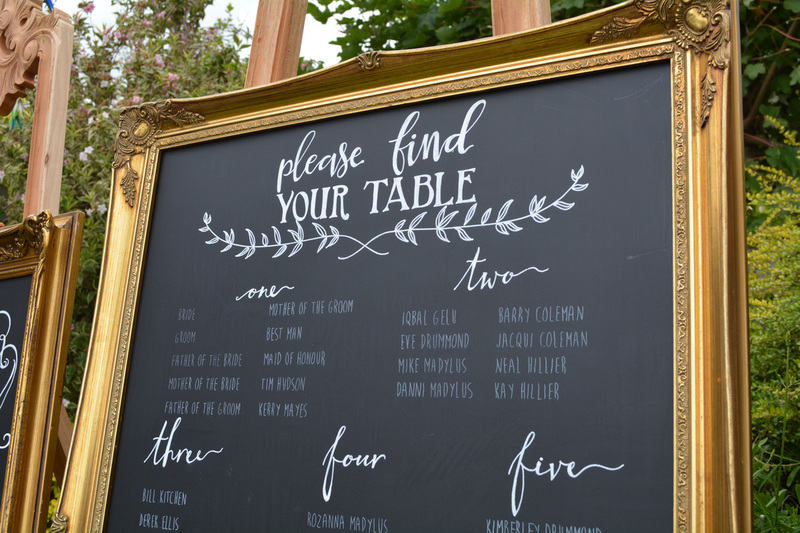 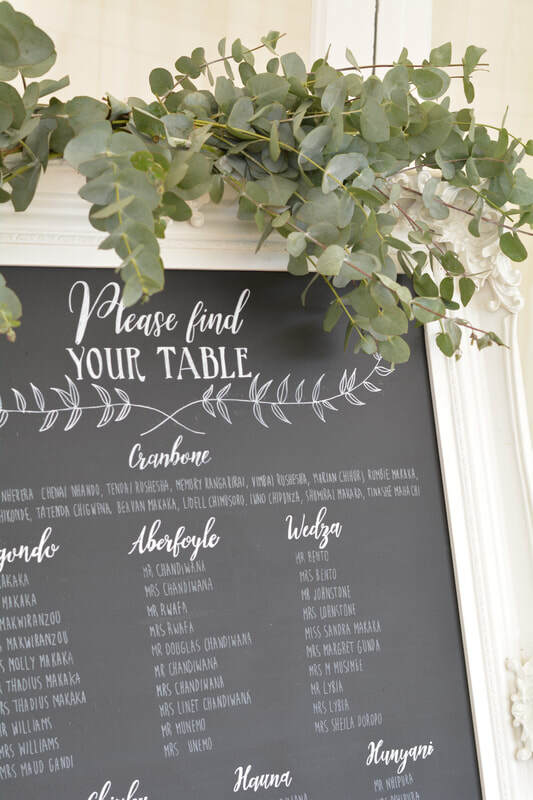 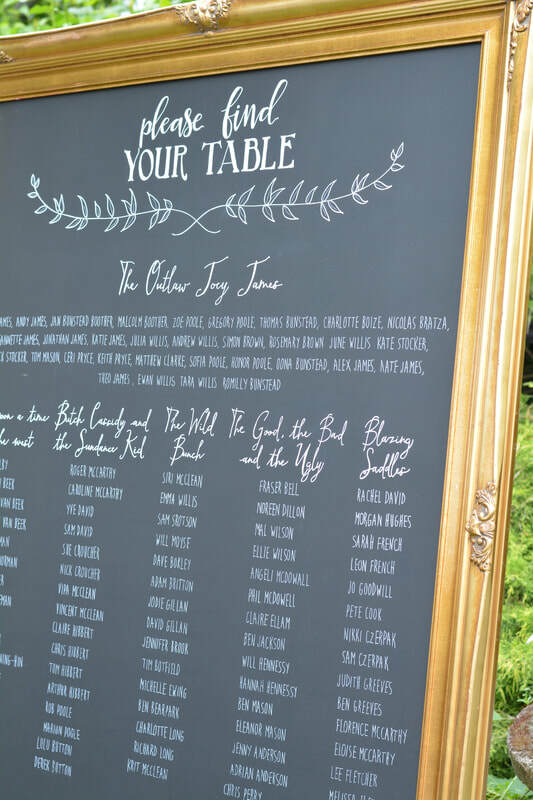 Each Chalk board table plan is bespoke. 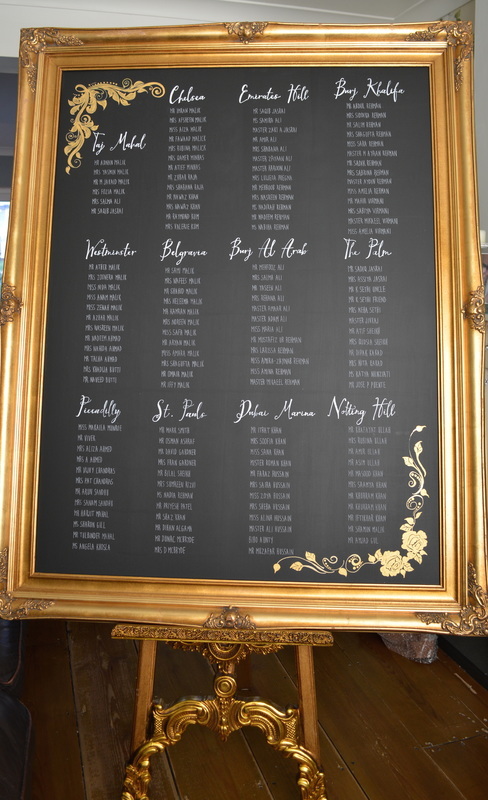 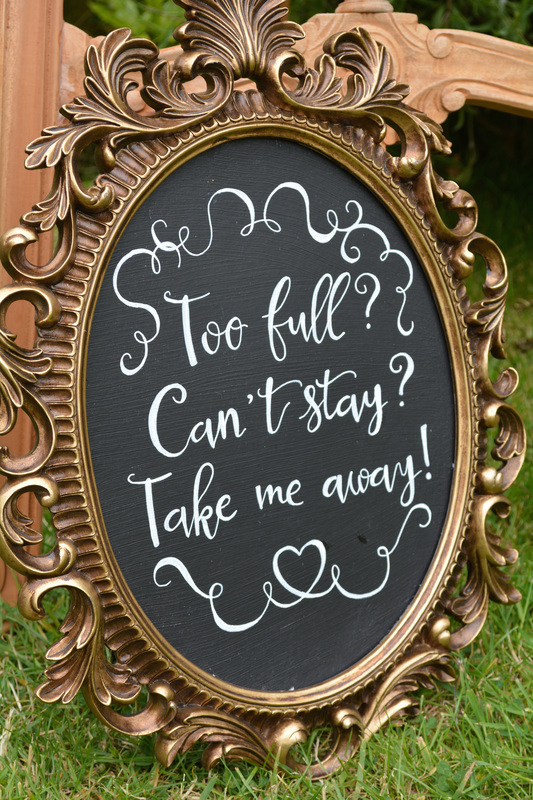 We offer gold, silver and cream ornate framed chalk boards or unframed. 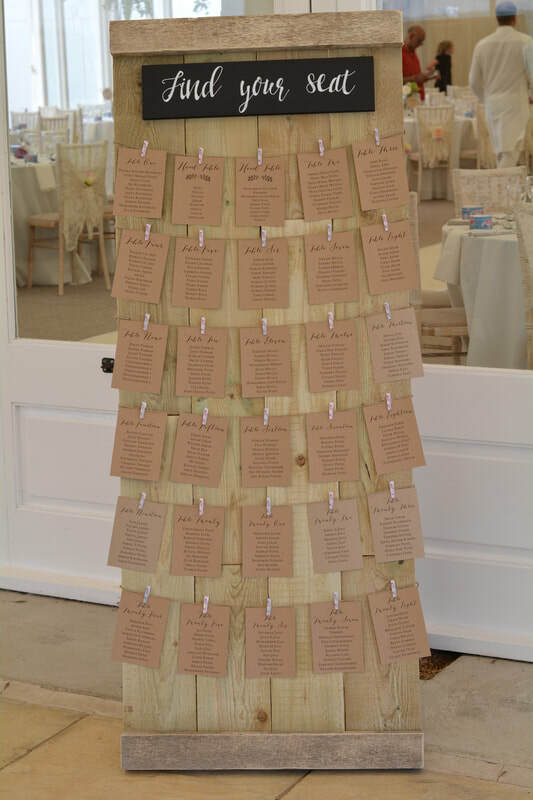 The tall tale plan is roughly the size of a door and freestanding. 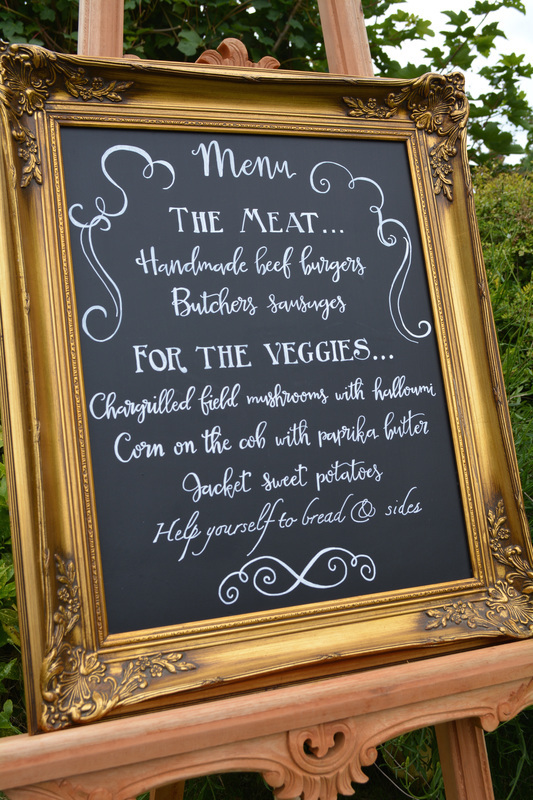 All of our chalk boards are hand painted. 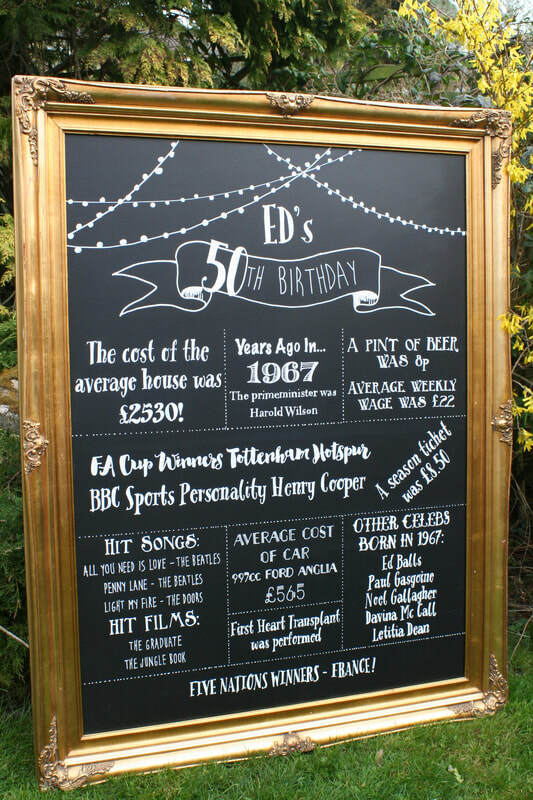 You can not achieve perfection with regular chalk, all of our boards are hand painted using acrylic. 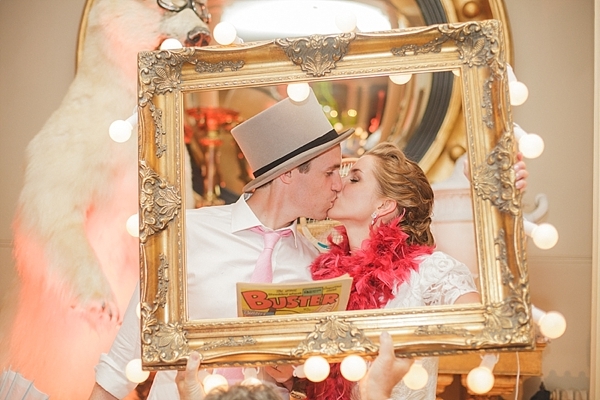 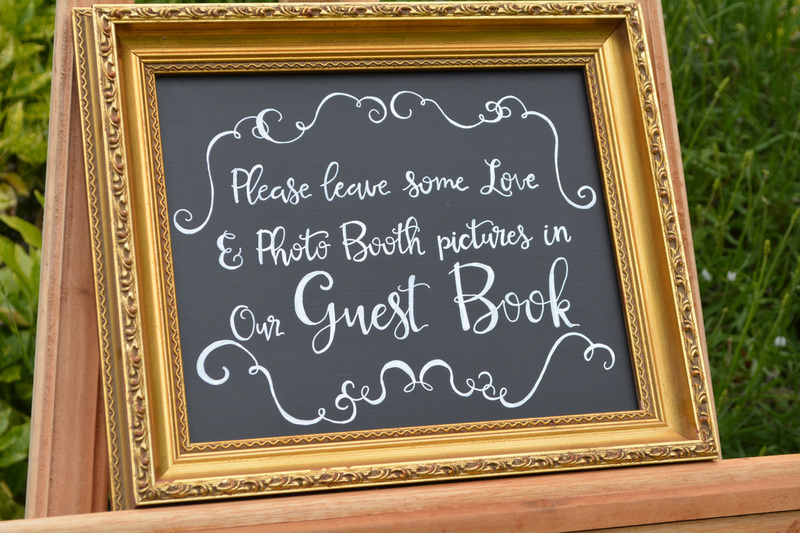 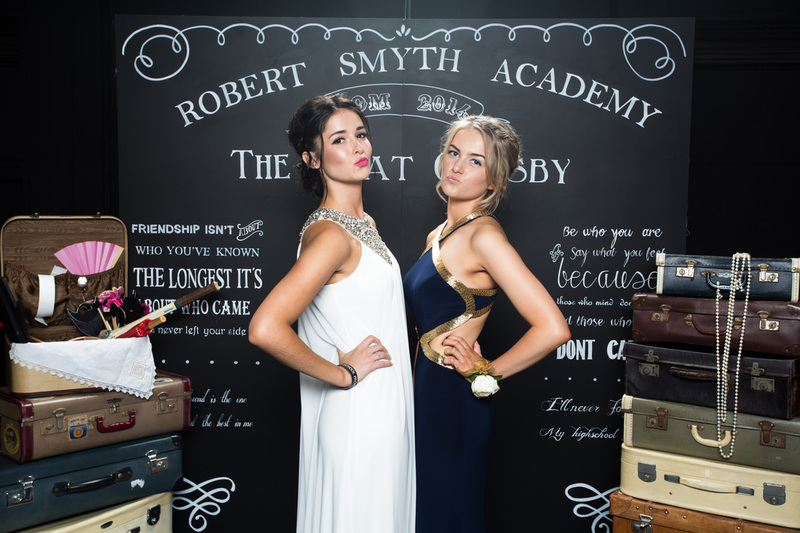 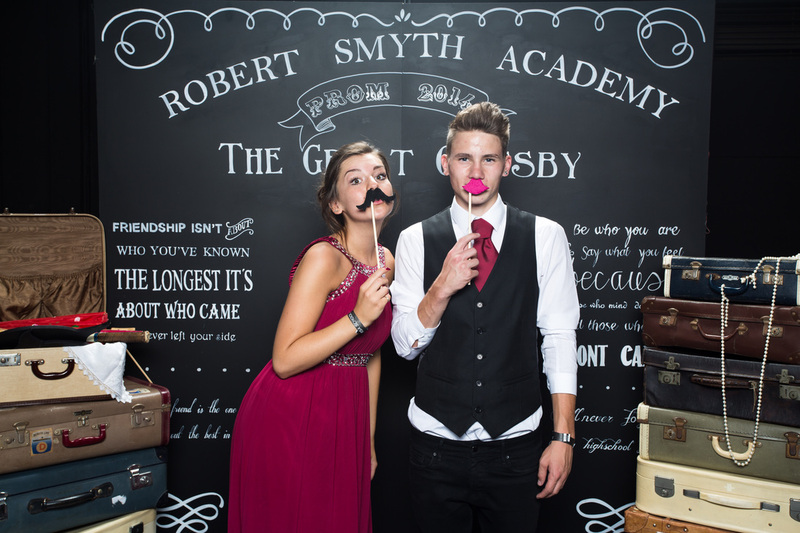 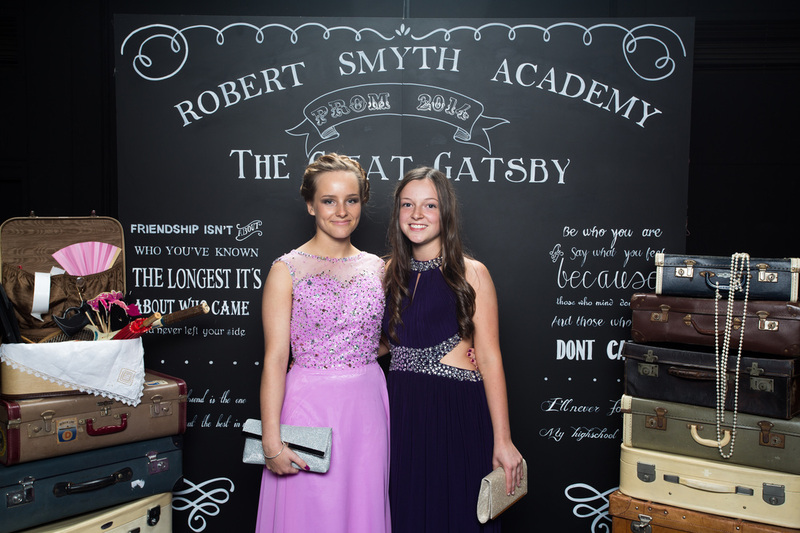 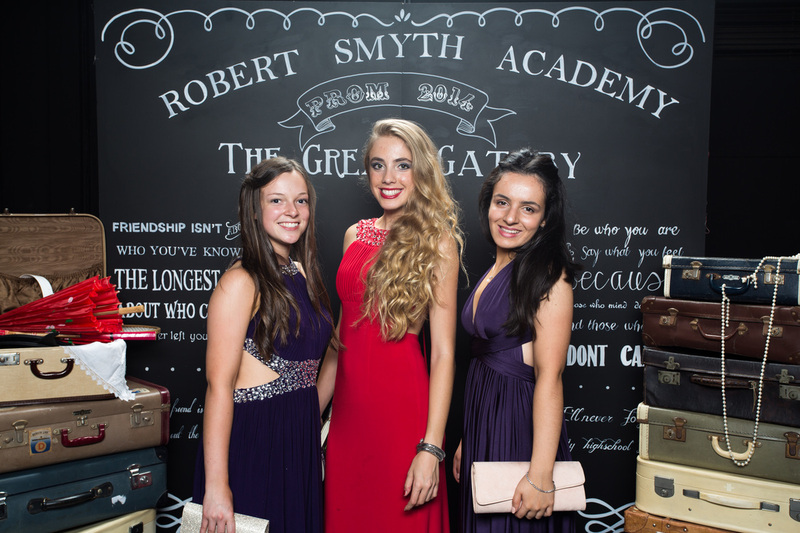 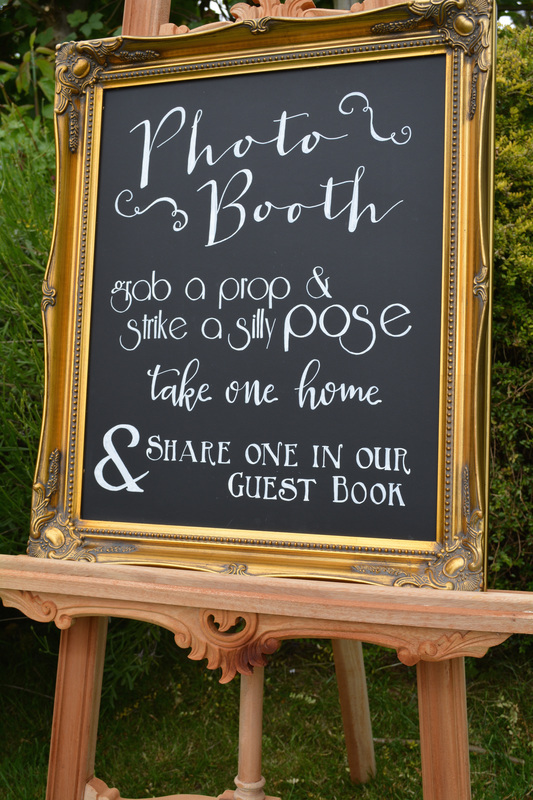 The Extra Large Chalk Board is perfect to use as a back drop for a photo booth. 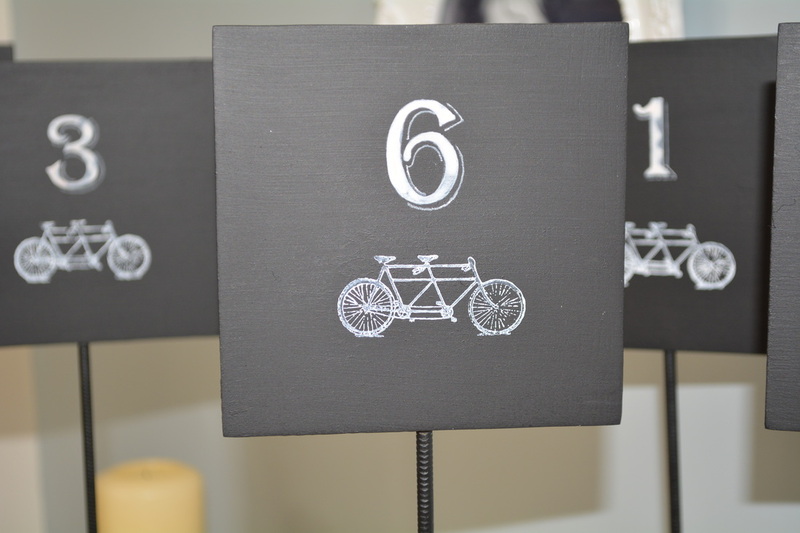 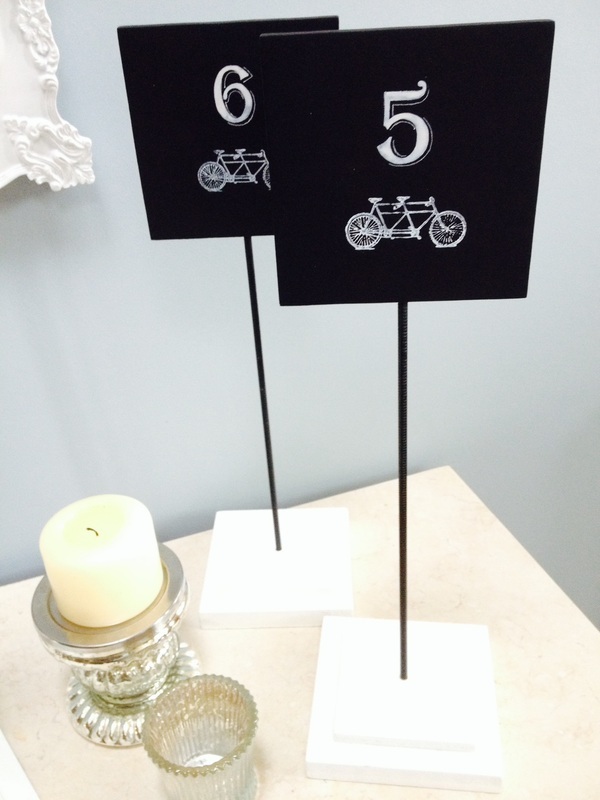 We also hire hand painted mini chalk boards with for your table numbers. 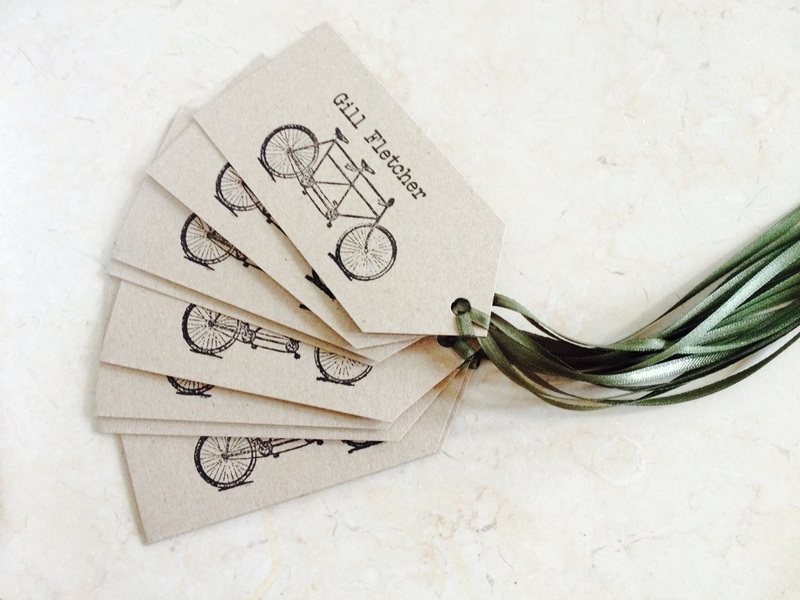 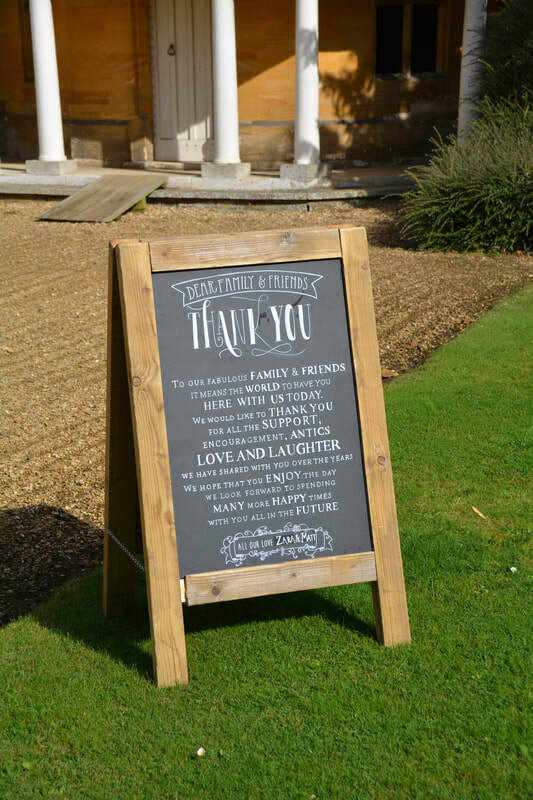 Pricing for the boards is not straight forward as this is an entirely bespoke item. 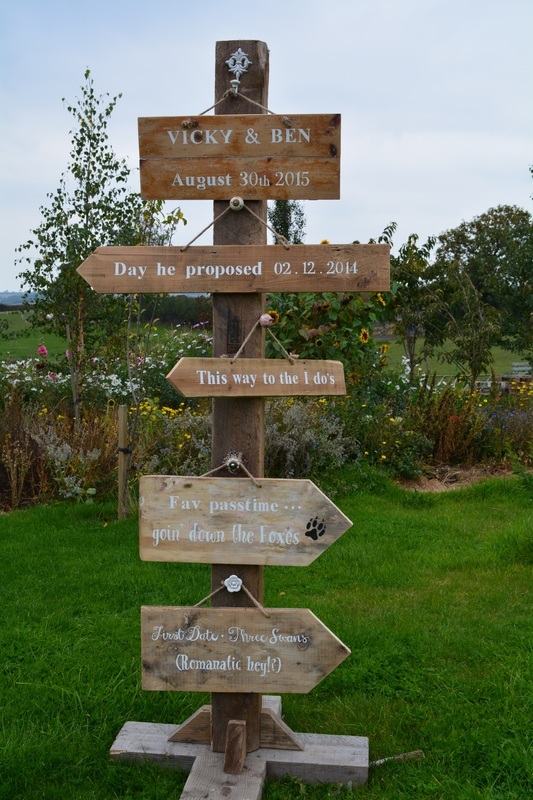 Below is a good guide but please contact me if your looking for something a bit different. 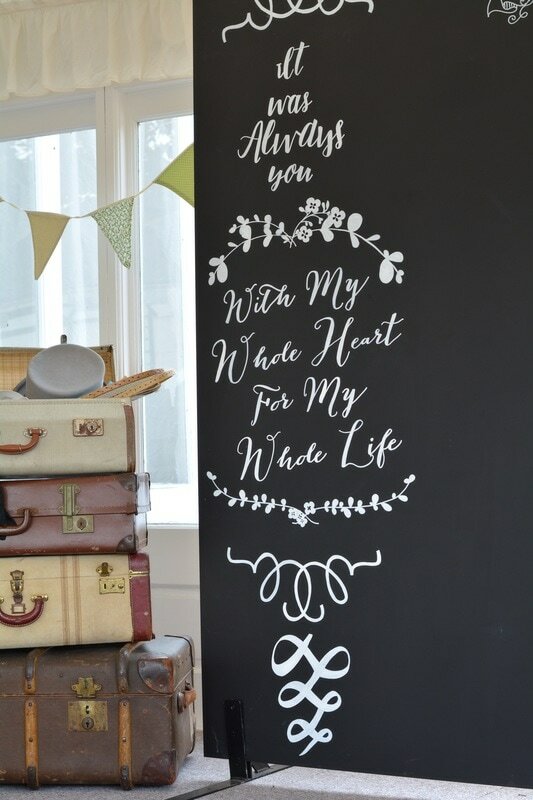 Medium £45.00 - 50cm x 40cm Hand painted. 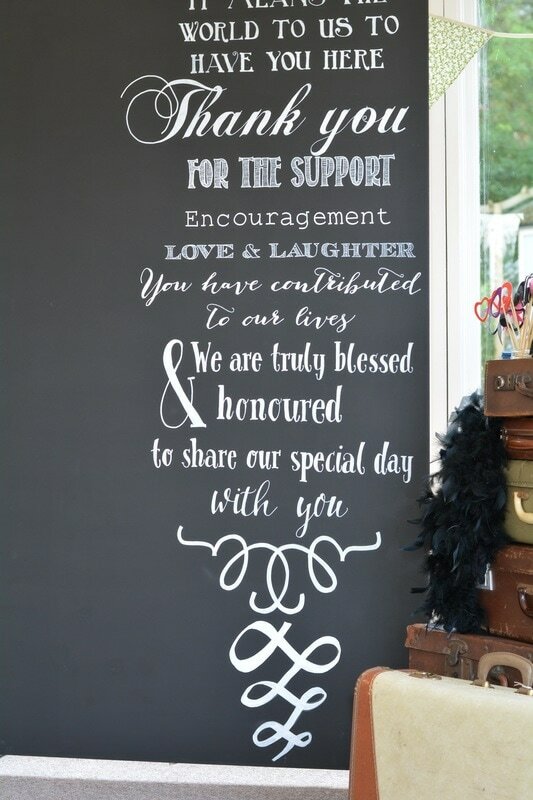 This is for approx. 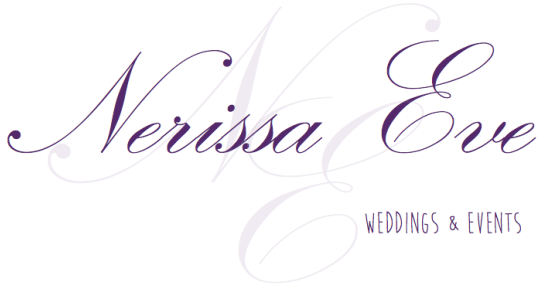 4-5 lines, e.g. 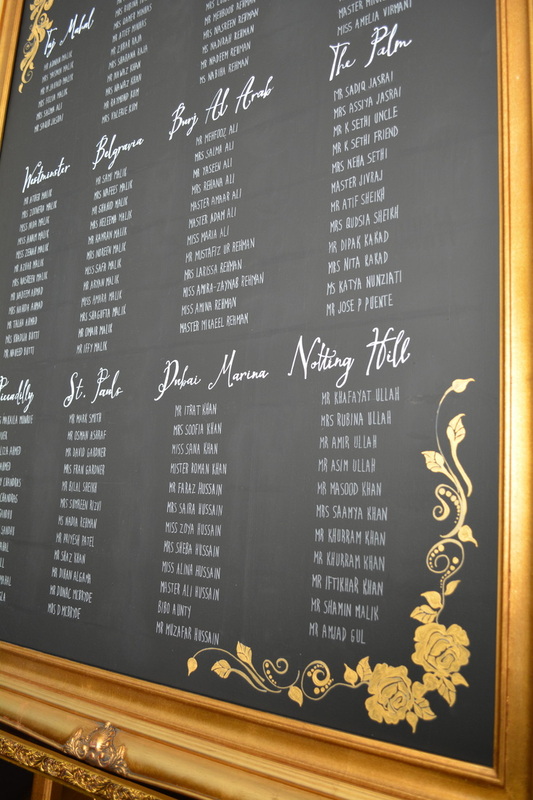 Welcome Board. 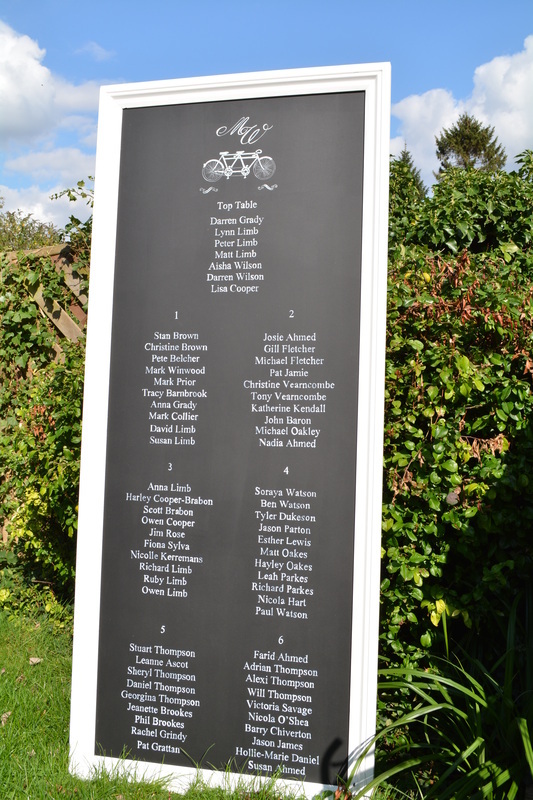 For a more detailed board please get in touch for a quote. 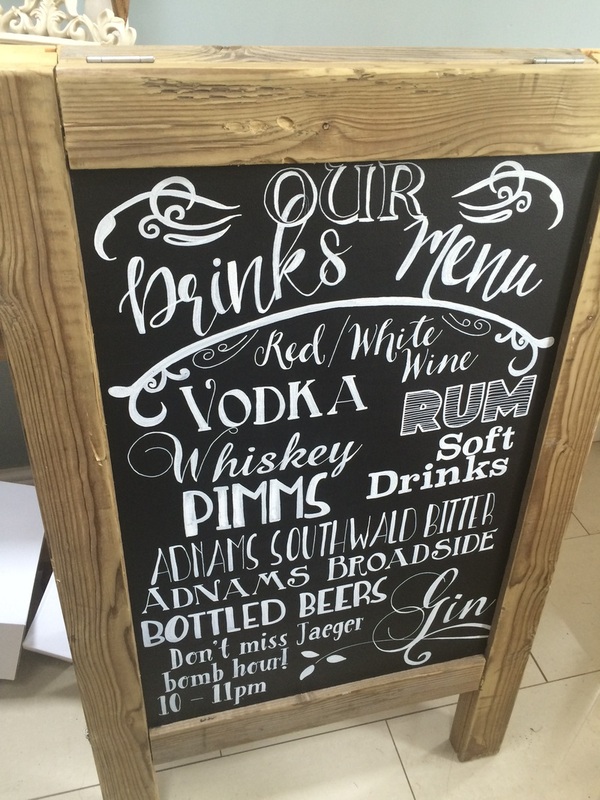 Large £80 - 80cm x 55cm Ideal for your Order of the Day or Menu board. 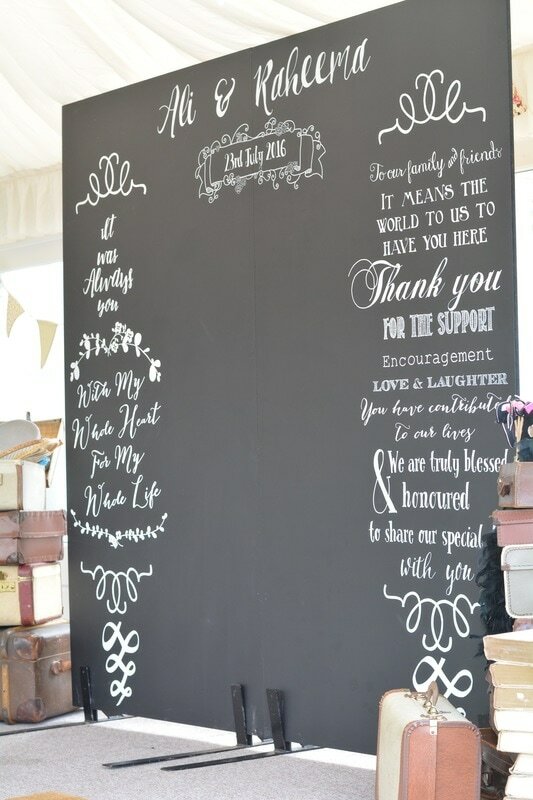 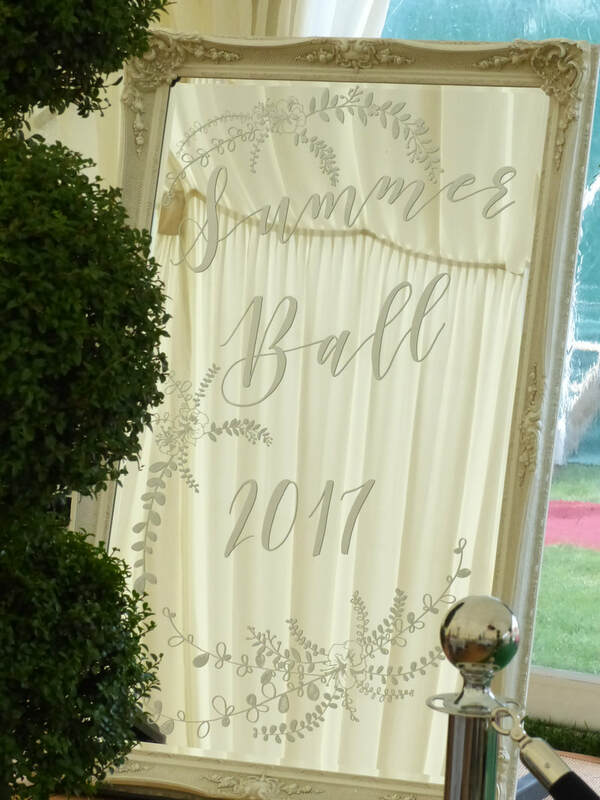 Extra Large backdrop - 220H x 210W Hand painted with your own verse and design. 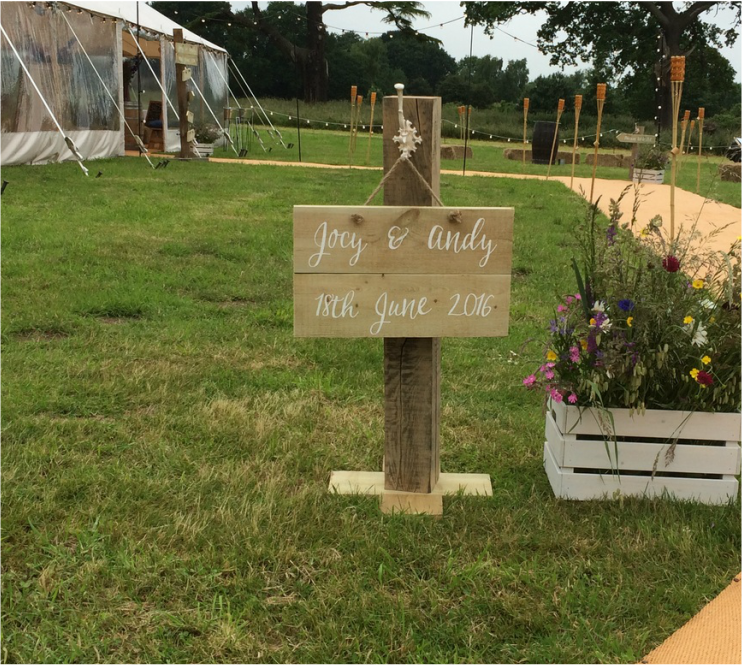 Supplied in two pieces hinged together, free standing on hard or soft ground. 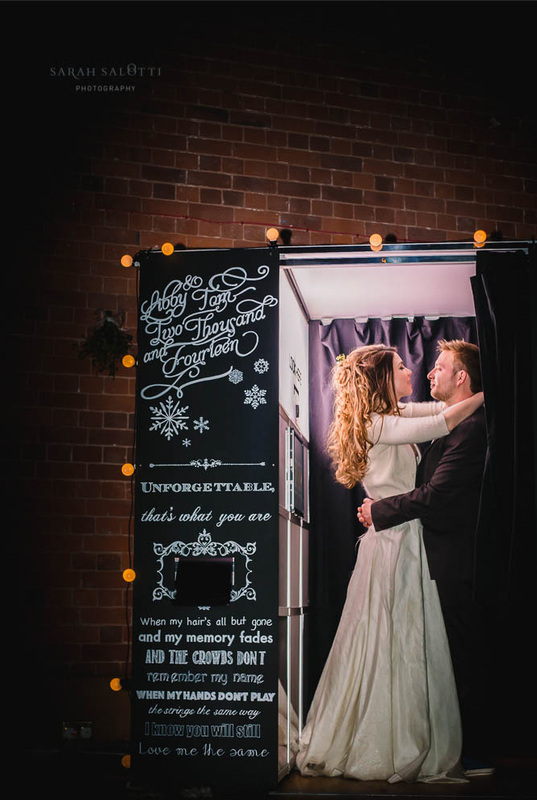 Ideal as a photo backdrop for a DIY photo booth. 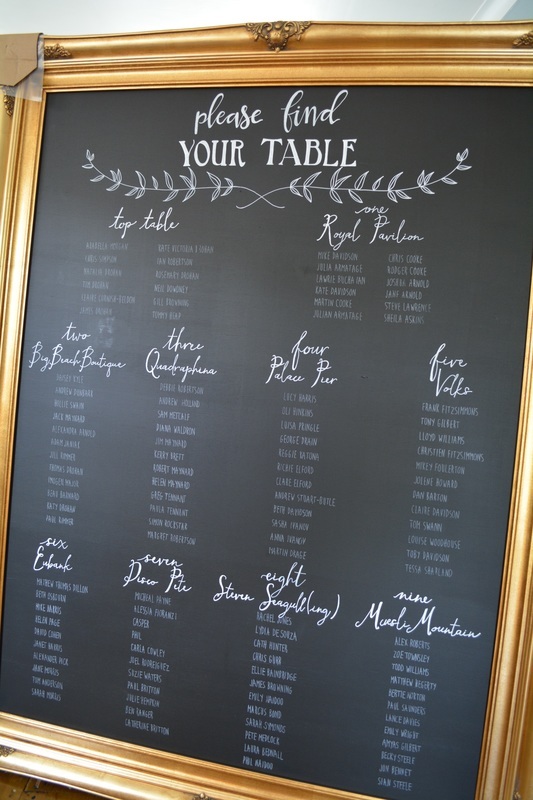 This can be hired blank for you to design and write on yourself contact us if you prefer to do this. 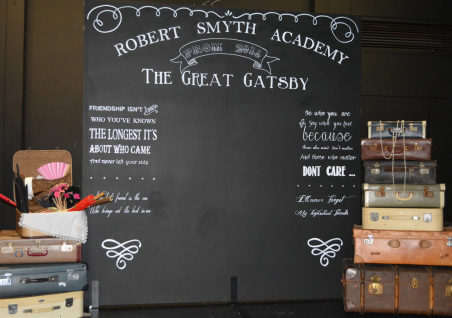 Extra Large package £290 - includes hand painted chalk board backdrop, prop box filled with exciting vintage inspired props & prop sign 'Grab a prop and Strike a pose'. 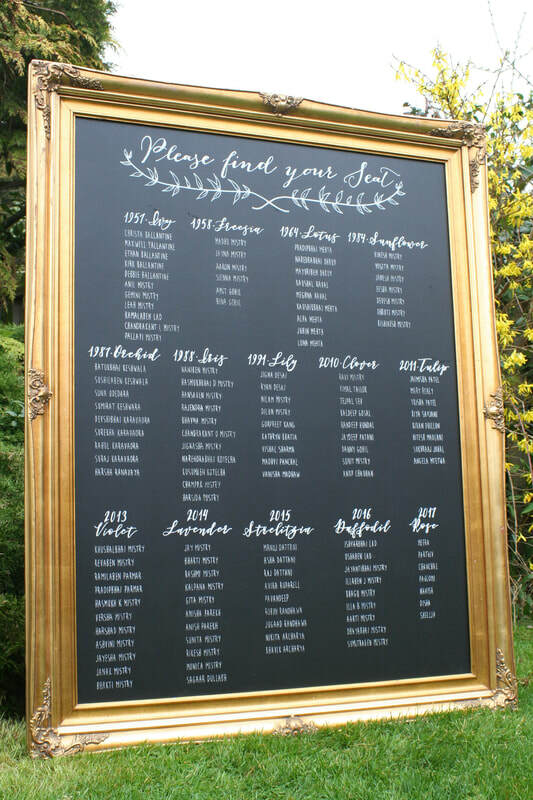 If you prefer to hire the boards blank for you to write on the board yourself contact us.